Hey y’all! I’m back with another cute top I made for the summer. Its an ankara wrap top with a peplum. This was the perfect top for summer 2017. Cute and sassy! Pattern Description: M7602 Close fitting mock wrap top has peplum and flounce options. 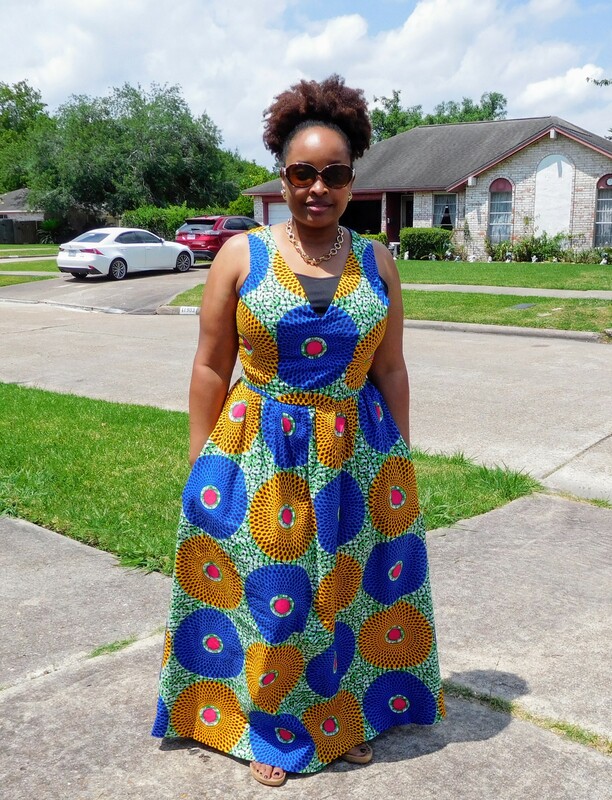 Includes separate pattern pieces for A/B, C and D cup sizes.Fabric Used: I used an Ankara fabric that I purchased from a local boutique in Houston. The print was interesting to work with because of the way the stripes were set up. My sister laughs at my photos. She always ask me why am I standing like that. Hopefully I will get better at modeling my clothes. Modifications: I did have to add 2 darts in the back to get a closer fit. I also inserted a lapped zipper instead of an invisible zipper. Overall: This pattern came together quite easily. I liked that it has separate cup sizes and options for color blocking and print mixing. My plan was to use the blue and white stripes of my fabric as the flounce, but I was dealing with left over fabric, so all of my stripes ended up in the back. Why did I have to piece together my fabric to make this top? Well, I’m glad you asked. Many years ago, a young girl used to go to the local Cloth World* store with her mother. She would spend many hours here looking through pattern books, touching fabrics and jumping on the foam and stuffing for pillows. One particular visit, her mother decided she was tired of the young girl’s whining and let her choose a pattern. You see, this was a big deal, as her mother rarely let the young girl choose her own patterns. The young girl was so excited! She knew exactly what type of dress she wanted. She had recently become obsessed with heart shaped tops and lots of ruffles. This dress even had a tie end on the back! The mother looked at the pattern and then looked at her daughter and after a little pleading, she bought the pattern. The young girl was so excited! She couldn’t wait to get her dress made. So, she waited, and waited, and waited. She finally had her dress made….in 2017. *Cloth World is now known as JoAnn Fabrics. That young girl was me, and I made my dress for my daughter. Ha! She loves it! Mostly because its pink, but after I finished my top, she liked it because we matched. Aww! Hopefully I will be able to get some pictures of us together in our matching outfits before she outgrows her dress. Happy sewing! Great story and beautiful creation! Wow gorgeous and a great story too! you know i love everything you have made and so proud of you continuing to want to do sewing. keep up the good work! !